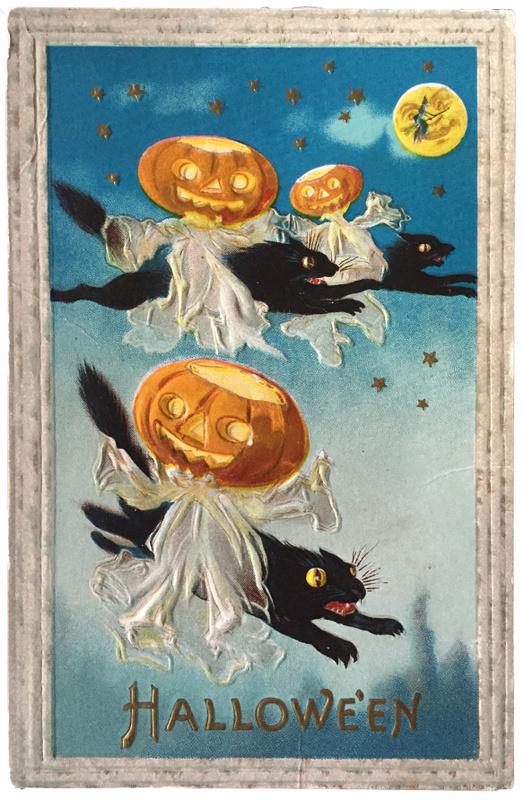 Do you send Hallowe’en cards? Judging from the racks of greeting cards in stores these days, many people do. 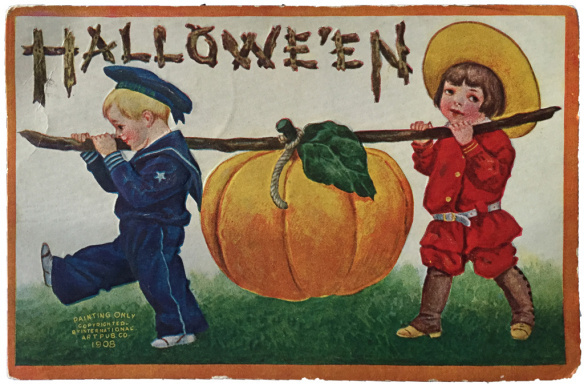 Stores selling Hallowe’en costumes and party gear are now occupying vacated commercial space. October issues of magazines offer decorating ideas including “Boo-tiful” tablescapes. 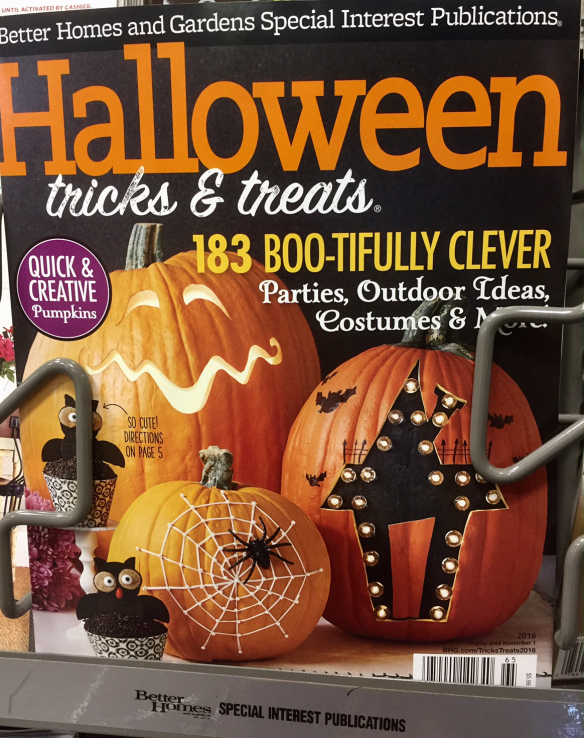 The current Better Homes and Gardens special edition (2016) displays patterns for creative pumpkin carving. 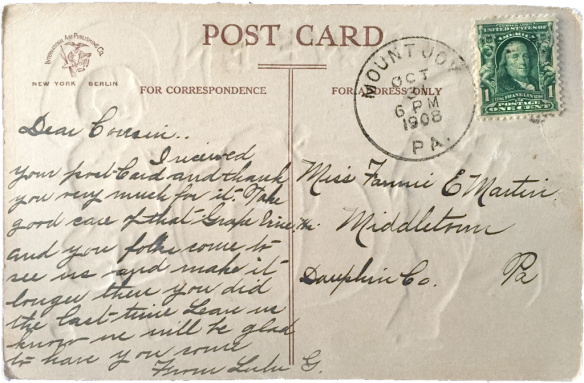 This magazine, founded in 1922, was not even in circulation when my Grandma Longenecker received these postcards, this one an invitation from cousin Lulu, mailed from the Mount Joy, PA post office in October 1908. The venue is John Ebersole’s barn in Kingston, PA. 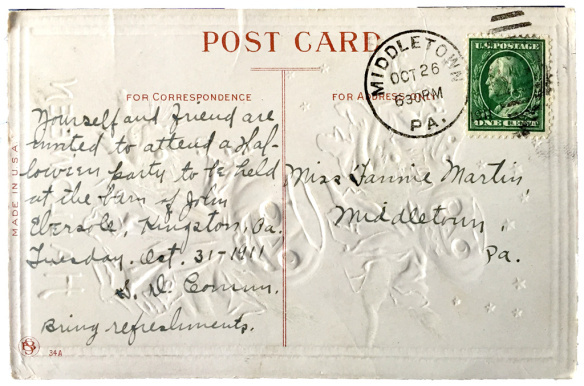 The date: Tuesday, October 31, 1911. According to Google Maps, Kingston is 112 miles from Middletown, Fannie Martin’s hometown. By car, in this century it would take about 2 hours. Did Grandma Fannie attend? Was her transportation horse and buggy or a Model T Ford that was in production as early as 1908? It could have been Model A Ford manufactured in 1903 – 1904. And I wonder how refreshments would fare during the long trip? I am pleased to have access to such family artifacts, but I have to speculate about so many details surrounding the events. Grandma would have known, but she’s not here any more, so I can’t ask her. I can live out my days not knowing details about a minor, but interesting, event. If I devised a story from this event, I’d have to indulge in “perhapsing,” a creative non-fiction technique I discussed in this post. What artifacts have stoked your curiosity about family events of long ago? How do you fill in the gaps when details are vague or absent? Coming next: Are you are with-it?